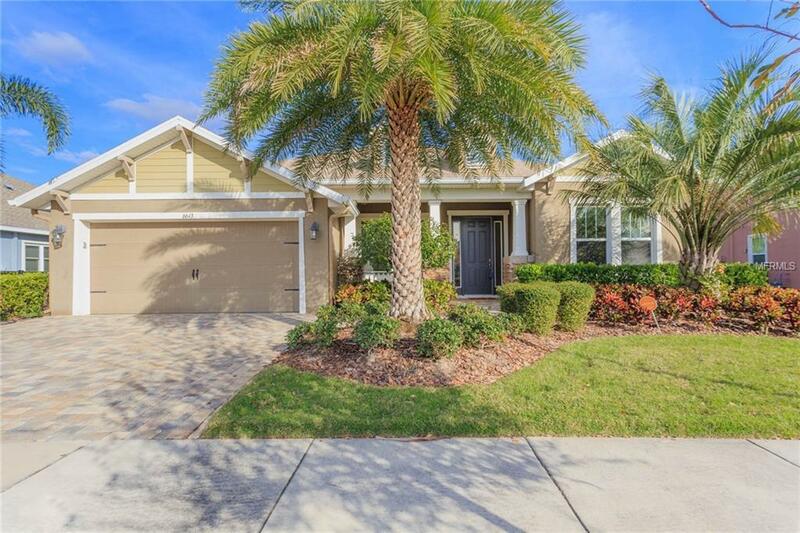 Well manicured pool home boasts paved driveway, lush landscaping and endless upgrades! Spacious 4-bedroom, 2.5 bath single family home with two additional rooms that could easily be used as a den, office space or extra bedrooms. As you enter the home, you will be wowed at the high ceilings, gorgeous crown molding throughout and oversized ceramic tile laid on diagonal. This home has an open floorplan with great flow between the dining room, kitchen and living room. Kitchen features granite countertops, stainless steel appliances, built in desk area, large center island, and breakfast bar. There is a half bath conveniently located off the living room, great for guest use. The two secondary bedrooms have ample amount of closet space and share a full bath with oversized vanity. The master suite is located on the opposite side of the home for added privacy. Master features ensuite with double vanities, separate tiled walk-in shower and garden tub. The large walk-in closet also connects to the laundry room, which is a unique and convenient feature. From the living room, fully opening glass sliders create the perfect indoor/outdoor space. Enjoy the Florida lifestyle all year round with the heated pool, covered lanai and fully fenced backyard with no backyard neighbors! Community amenities include clubhouse, fitness center, community pools, splash pad, dog parks, playground, amphitheater, fishing pier and miles of walking trails.